Details: Scenic beauty, an exhilarating on-snow experience and a high-energy nightlife combine at Heavenly, part of the Vail Resorts family. 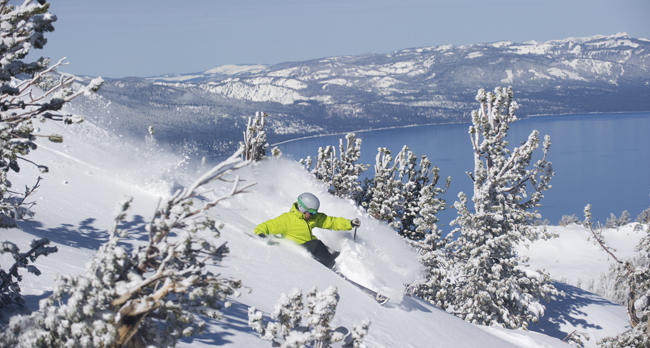 The resort encompasses 4,800 acres, climbs to Lake Tahoe’s highest elevation at 10,067 feet, has the longest vertical drop (3,500 feet) of any resort in California, and features 97 trails for every level of skier and snowboarder. New for 2012-13: The halfpipe in the High Roller Terrain Park has returned after a four-year hiatus, and the new edition boasts some impressive stats: It’s an 18-foot-tall, 500-foot-long competition-quality pipe with a 56-foot-wide transition. Also, getting to the resort from Reno International Airport is much easier with the opening of the I-580 freeway from the Mount Rose Highway in Reno to the north end of Washoe Valley. The route has three lanes in each direction and uses anti-icing technology on all nine bridges. Snowmaking: The resort claims to have the West Coast’s largest snowmaking system, enabling it to produce 120 inches of snow each season. That’s on top of the 350-plus inches of natural snowfall it receives every winter. During the summer, 10 Viking V2 snowguns were installed along the Lower Stagecoach run on the Nevada side of the mountain to improve coverage there. After dark: There’s no night skiing/snowboarding. Lifts operate from 8:30 a.m. to 4 p.m. on Saturday, Sunday and holidays; from 9 a.m. to 4 p.m. Monday through Friday. Hidden gem: Bohemian Grove, a black run at the bottom of Olympic Express. “It’s steep with a good fall-line pitch and is often overlooked,” said Sally J. Gunter, resort spokeswoman. Spotted last season: American freestyle skier Glen Plake and restaurateur and TV personality Guy Fieri; at Tamarack Lodge was “Glee” star Matthew Morrison. Eats at the resort: Tamarack Lodge at the top of the Heavenly Gondola serves grilled fare, artisan pizzas, chicken corn chowder, a salad bar and a variety of other dining options. On the California side, Steins has outdoor dining and serves grilled Euro-themed sausages. At the Gunbarrel Grill inside Lakeview Lodge, made-to-order gourmet burgers and a large selection of microbrews are among the menu highlights. Eats nearby: 19 Kitchen~Bar (775-586-6777, www.harveystahoe.com) at the top of Harvey’s has spectacular, unobstructed views of Lake Tahoe in addition to elegant fare. “The lobster mashed potatoes are a must-have and pair well with the signature steak and seafood dishes,” Gunter said. Finish the meal off with complimentary cotton candy, which is always a fun-to-eat treat. Après-snow hotspot: Unbuckle at Tamarack, at the top of the Heavenly Gondola, will be open seven days and nights starting this season.